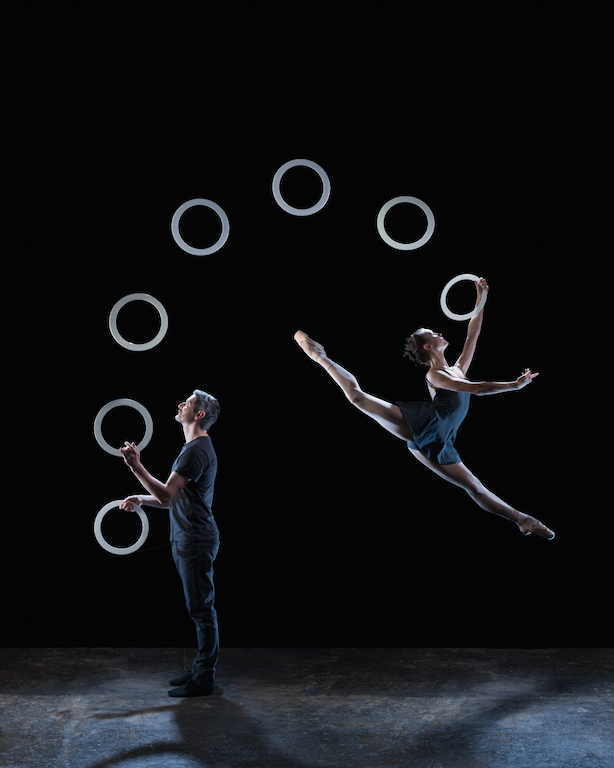 Sean Gandini and Kati Ylä-Hokkala have been the backbone of the juggling company Gandini for 24 years. Their signature style, a hyper awareness of geometric rhythms made three dimensional in tangible space, has both an exciting and a comforting effect on the observer. Watching Gandini perform their newest show, 4X4 Ephemeral Architectures at the 2016 Montreal Complètement Cirque Festival was a bit like watching fractals unfold, or flowers bloom and contract, but all the while with the pollinating insects buzzing around doing their magic work. 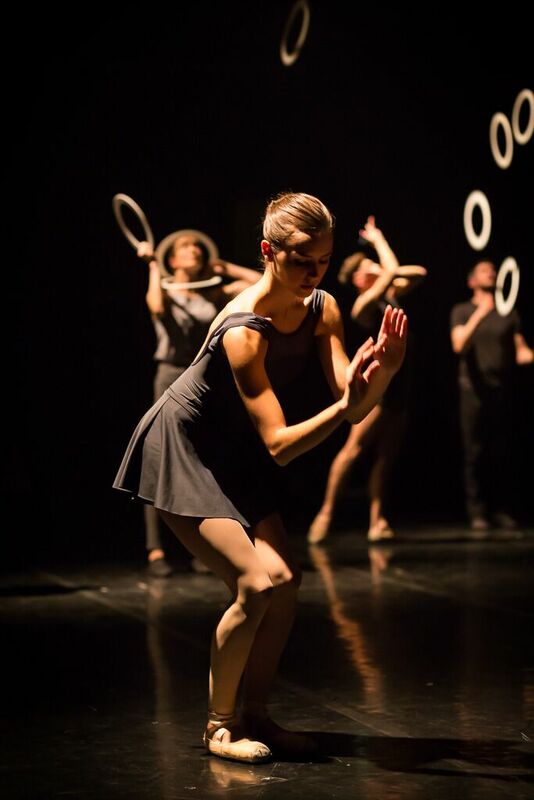 Those pollinators were not simply jugglers this time, but also four ballet dancers in their midst, weaving in and out of the juggling patterns, their precision and grace mirroring that of the juggling patterns with the jugglers themselves echoing the moves of the ballet dancers. It was quite a different kind of show for audiences, and yet in line with the type of innovation and artistry Gandini has been forever evolving towards with their juggling. They’ve been using dance and movement far more than their juggling colleagues for years and continue pushing the threshold of juggling in its own unique direction. During the 11-day contemporary circus festival this July, I met with the duo Kati and Sean over a coffee in the Milton Park Neighborhood of Montreal to discuss their work and their vision for the future of circus. Their conversation was welcoming and charming, and so often funny and enlightening that it was difficult to say goodbye and let them go on their way to prepare for their show. Kim: Tell me a bit about the origins of Gandini juggling. Sean: I was doing street shows in Convent Garden, doing kind of an eccentric juggling thing. I don’t think I ever completely understood how the street juggling thing went. I used to do juggling to classical music on the streets. Kati had just retired as a rhythmic gymnast and she was au pairing in London. She turned up and said “Oh, can I have a go with your clubs?” I said “Ok” and she picked up the clubs and went (fancy hand movements) and I thought ‘Oh wow!’ So then we met every Sunday. The gym where we used to practice also had dance classes and one of the dancers said why don’t you come try one of these dance classes? So we started dance and imagining what it would be like to filter juggling through the lens of dance. So right from the beginning we were making work that was very of a dance aesthetic. We’ve been making work for 24 years which seems a bit long. Time flies! Kim: Is this your first time performing at Montreal Complètement Cirque Festival? Sean: No, we came with our larger scale show Smashed three years ago. It went very well and it’s nice to be back. Kim: You’ve been to so many festivals! What do you like most about performing at a festival? Sean: Actually, we love sharing what we do and we are very fortunate to be in a position where people are interested in the things that we make. And the things we make are not always the most obvious things, so I love the idea that people are interested in something a little more complex or a little less apparent. It reassures me in humanity. But its lovely—we meet so many different people from different parts of the world. So yeah, meeting people is good. Kim: When will your book be released and what is it about? Sean: The book is almost finished printing. We’ve done a limited edition hardback and a paperback. It should be available within a week or so. It's beautiful and it’s called Juggling Trajectories. It’s written by a man called Thomas Wilson. When he was 14 he saw our first show and he wrote his thesis on our company. He is like our company archivist. But he also has a very interesting way of reflecting on pieces and the way they fit historically. So in a way, he’s explained our journey to us. So the book is for us to understand our journey. Kim: (Laughing) Is it interesting to read that? Kim: What was the secret to your juggling success? Sean: Actually, I think success is a strange word. Because partly we are very resilient, and in the beginning we were making work and people were going “What the hell is this? We don’t understand this.” We just really believed in it. But I have known people that have had that resilience and who haven’t seen it through. I think partly the fact that we are two artistic directors probably helps a lot because if you are on your own when times get tough, it could be easy to give up. Mostly it’s been a positive ride but there are moments where you get a bad review in your early days or you are in debt with the bank or something and you wonder “Why am I doing this?” So it's seeing it through those periods. Kati: But also, it’s the fact that we’ve always shifted direction. So in the beginning when we had financial problems with touring because it just wasn’t financially viable, we shifted a little bit towards corporate work to just be able to sustain the company. So we are always jumping in to slightly a different direction and we don’t say no to a job in a shopping center juggling for kids. We take everything. It’s a different performance, but it’s partly one of the reasons we survive because we put our eggs in so many baskets—not just one thing. Sean: Also, we’ve always been counter current. For example, at the moment there is a certain wave of circus which I really enjoy watching, but I really don’t feel like we are part of that family. So I think what Kati was saying is right; do many different things at the same time and also just believe in you thing even if it’s completely different to what everyone else is doing. Kim: What advice would you give new jugglers who want to become a professional? Kati: Diversify within your own field. Kim: But in what way? Kati: Be ready to do a 7-minute act, but also be ready to go and do a walkabout on the streets. Because if one way of making money dries out, you’ll have the other one left. Otherwise, you’ll be stuck. Sean: In Europe right now for example, there is a movement for jugglers to do one prop and one act and I feel like it just limits them in the long run. But you’re right, diversifying creatively is good. It’s an art form, but it’s also a business, so you want to think of having different avenues. Kim: Why do you think people love juggling so much? Do you ever notice that juggling always draws a crowd? Sean: That’s true, but juggling also suffers from preconceived ideas about what it is and what it can deliver. The same thing that gives it the appeal that you described where we go ‘Wow!’ sometimes limits it. For example, I had a strange incident at my gym recently. A quite nice muscle builder man was watching me juggle and he came to me and said “It’s very strange. I’ve been watching you for about two hours and you are very skillful, and yet, you don’t annoy me.” That really intrigued me, and I said to him, “Do skillful people normally annoy you?” and he said “Oh yes, of course.” I don’t know about North America, but in the UK, skill is often seen as a provocation. As a ‘Look what I can do that you can’t do’ thing, particularly with juggling. Fiona: (assisting with microphone and heretofore silent) That happens with handstands too. Kim: What did you say to him? Sean: Actually I had a conversation with him and it was very interesting. He was an actor who didn’t do well, so maybe there was an element of frustration. Watching skill is a complex thing. I work with some of the best jugglers in the world and some of the other best jugglers in the world have just joined our company for our next piece. Within the company you say “Wow, it’s amazing to see someone that’s so skillful!” But at the same time it makes you question your own skill if somebody is good. So I think watching skill is a complicated agenda. Maybe that’s a more complicated answer than you hoped for. The simple appeal of juggling is repeating geometrical patterns. Kim: That’s what we find comforting? Sean: Yeah, I think so. I think there is a pleasure in the organizational geometry of it. Like music is organized geometry. Kim: 4X4 is rooted in dance and juggling, have you always played with this concept and is this the furthest you’ve taken it? Sean: Perhaps hated the movement. Kati: I don’t know about hated, but it wouldn’t have been her favorite thing what we’re doing now. Sean: I think she would have enjoyed the structure of the thing. Kati: Yeah, because she moved consciously away from ballet because it was so rigid. Sean: Well, if someone had said to us 20 years ago “You will do a piece with classical dancers,” we probably would have laughed at them because we were very “Oh no, no, this isn’t what we do.” I think we’ve become more open minded in old age actually. Sean: I think we always maybe harbored secret crushes on ballet and then when that door opened—well, now we’re quite ballet obsessed. Amongst other things. Kim: Do the ballet dancers juggle and do the jugglers dance? Sean: I would say that the jugglers do more of what the dancers do than the dancers do of what the jugglers do. One or two of the ballet dancers do a little bit of juggling but all of the jugglers do a considerable amount of movement. But I’d say the movement isn’t necessarily classical –-they have a lovely sense of movement and understanding steps and structure. Kati: But before a show we always all do a ballet class together and its a full ballet class. Kim: Does flow or improv juggling play a part in your creation phase? Kati: I sometimes wish it would a little bit more because I’m so bad at it. Kim: It’s like a muscle you have to train maybe? Classical trained musicians sometimes have a hard time improvising and musicians who can’t read music often can. Sean: Yes, absolutely. I’d say that although our world isn’t organized like that--if it was, we’d be classically trained jugglers. Kim: Kati, what techniques from your past in rhythmic gymnastics got conveyed to your juggling, and visa versa? Kati: Everything, all of it. Because its throwing and catching. In rhythmic gymnastics my favorite bit was always the throwing and catching and not so much the body work. I wasn’t super bendy. I enjoyed the objects more. Kim: You were looking for juggling. Sean: She was! She was secretly looking for juggling. Kati: Maybe! And I guess the spatiality. When I came to juggling, the first thing I realized was that the jugglers always stay in the middle of the stage and they go sideways. And I thought, why aren’t they using everything? Because in gymnastics, you have to make a plan and use every bit of the floor. Kim: So you brought the geometry? Kati: I don’t know about that. But it annoyed me a little bit. I thought, why are we just going sideways? Kim: Sean, how does Kati’s creativity improve Gandini juggling? Sean: Gandini has always been a combination of both myself and Kati, so these are strange hypotheticals, but I think she is good at limiting. I sometimes have a grasshopper mind and I’ll have ten ideas a minute and so she’s good at saying ‘This one is interesting! Throw away those four others.’ And she is a great refiner of movement. Kati: My friend has beautiful, big ideas, but he doesn’t have so much patience for the details. So it is a question of— in order to make something, let’s finish this up. Kim: Kati, where does Sean get his ideas? Kati: God knows! There are so many of them. From the shower, from the train, from the airplane! But there are so many ideas that it is crazy and it really is a question of limiting. But it is amazing. Sean: We are fortunate that we have a team that is snipping all around. It used to be just Kati, but now we have two or three people in the office and a rehearsal director and everyone is sort of trimming it. Kim: Tell us about your troupe, what are they like to work with? Sean: We have a core group—it feels like multiple families— but not in a bad, divorced way. It feels like we move around families. At the moment, we are with the ballet family. We are lucky we have an adorable group of skilled people. Would you agree with that? Kati: We have an adorable group of skilled and harmonious people, but we also have a very nice boss. I think that’s important, because you can have a nice group of people who get very wound up by somebody who is leading them badly. Kim: Are you talking about him? Kati: (Laughs) But it’s important to have someone that people listen to and its fun. We are very rarely serious. It is mostly fun. Sean: That’s true. The ballet dancers have said that compared to working in ballet it’s a very nice environment. Because that world is so military. Kim: Do you invent your patterns with site swap or just by playing around until you discover them? Sean: We do every way of making patterns. But we went through a period of being site swap obsessed. I think we like systems, so we use systems to generate patterns. But in recent years there’s been what we like to call muses. Obviously, Kati has been a muse to me, but there are a few remarkable jugglers in the company who feed us patterns as well. The patterns come in but they don’t stay as they are. They go round to various people’s hands and get modified. So, we’re very lucky. We’ve just started working with Water on Mars and they came with seven suitcases full of patterns. We are producing them at the moment. We love having them and they have an exuberant, youthful energy. Kim: Time for a couple of either/or questions. Solo or group juggle? Sean & Kati together: Group! Kim: Outside or on stage? Sean: Actually, I think onstage as well. Kim: Your outside days are over! Kati: (Laughs) I really like it, but I’m not good at it. Sean, you are very good at outside shows. Kati: It’s a covered stage though. Sean: Do I have to choose one? I like them both. Can’t chose. Kim: What trends have you seen come and go in juggling? Sean: The kids that we’re talking about have started a good trend by opening juggling up. They’ve sort of had a mini technical revolution. They are thinking outside the box and creating tricks. If anything, they’ve almost pushed it to the other extreme where people think new is interesting for the sake of being new in terms of the tricks. So some of the youngsters make quite interesting new stuff, but they don’t have what we would call the basic juggling structure that you build on. It’s a bit like your scales on a piano. But then, there’s exceptions, like you were saying earlier a bout musical improvisers—some probably can’t play scales but can play great music. There are always exceptions. Juggling is very healthy at the moment. I call it the golden age of juggling. We’re in the golden age. There is so much great juggling being done across the spectrum from artistic juggling to sports juggling to the 7-minute people. Kim: Do you think that has to do with the health of circus in the world market or more to do with YouTube? Sean: I think it has more to do with YouTube. My suspicion is that there are a lot more jugglers that juggle for the sake of juggling and who won’t be performing it. I think the state of circus globally is a different thing and I don’t know if I’m always that positive about it because I feel like due to circus’ sensationalist nature it means that it is always sold in a certain way. Kim: How will juggling change in the next 20 years? Sean: It has changed so monumentally already. When we started and we were doing quite experimental stuff there were maybe three of us in the world doing experimental work. I’d say even now the amount of genuinely exploratory circus is small, because sometimes new circus is old circus disguised as new circus. So there is a constant reinvention. Personally, I don’t know what will happen, but I would love it to open more so that circus could be a whole range of different things—in the way that dance has grown. Kati: That has to do with the audience maybe a little bit more. Sean: I guess the producers are in a financial place where it’s easier to sell it a particular way. “Oh, it’s going to be big tricks and there’s going to be boys and girls in underwear.” So it sells and you sell it like that. But my hope for the future is that it diversifies itself. Kati: Yes! It’s already going that way. I mean, the fact that we can do the show we're doing here at a big festival is already a change, because it’s not boys and girls in underwear, and it’s not big tricks. Kim: So you wear actual clothes on stage? Kati: (Laughs) Yeah, we have to. Kati: I don’t think the world was quite ready for that. Kim: That’s interesting. So its ok to do underwear circus but to question it was too much? Kim: Do you teach and have you considered opening a school? Sean: I don’t think we have time to open a school. Kati: For many years we’ve talked about opening an institute that is not exactly a school but some sort of courses, workshops and specialization. But I don’t think that is going to happen for at least 10 years. Sean: It would be nice to help more women get training. One problem we have is finding good female jugglers. Its almost 30 to 1 men to women, I would say. It’s virtually impossible to find women. Most of the women who have those capacities are working with us already and there are three or four who are not. Kati: Or they are very far away. Sean: Or they are in Russia, married to engineers. Not that I’m thinking of one person in particular. I’m not going to say who, Svetlana. Kim: In our community, we’ve discovered that a lot of the jugglers and circus people we know are mechanical engineers. Sean: Yes, that’s true. I’m a Darwinian thinker and I don’t think it influences how one judges, but I think it might be something in the mind. I go to ballet and it’s all women. I’m the only man. Maybe that’s just how it is. Fiona: It also could be socialization and how you grow up. Sean: Yeah! Or your role models. Kim: Back to our show off conversations, there is a little bit of a boy’s club attitude at some juggling gatherings. I’m not sure if it’s at your level. Sean: No, no, but there is. Kati: Yes, even in the nicest of environments,like our company, there is a little bit of that and you have to keep up or else. Sean: But at some point, we thought it would be great to encourage more women to get involved with juggling. At the moment, there is a fantastic thing happening in Kabul, Afghanistan where there is a circus school. Where most of the people who are good at juggling are these little Afghani girls. If you can, Google Afghani circus! There is this one, I think she’s called Layla, she’s the best one— she does five clubs. But there’s these lines of little girls in traditional garb juggling four balls. It’s the most beautiful sight! So we’ve been thinking in 2018, we’re going to try to bring them over and do something. Kim: So cool! What is next for Gandini? Kati: We go to Paris to do the apple show, Smashed. Sean: We land in the morning and we have two shows in the evening. Actually, we have a crazy little journey where from here we go straight to the European Juggling Convention where we do Smashed with 20 people, that’s everybody who has ever performed in Smashed. Then we do this piece 4X4 for jugglers so it will be interesting to see how they read it. At Circus Promoters, we are committed to increasing your access to happenings and trends in the worldwide circus community. We also aim to provide access to exclusive interviews with inspiring people in the industry. If you are not a member of Circus Promoters yet, registration is free and all levels of performer are welcome. Visit circuspromoters.com to create your profile and learn about employment opportunities. Kim Campbell is a circus and theatre critic and writer. She has written for Spectacle magazine, Circus Now, Circus Talk and was a resident for Circus Stories, Le Cirque Vu Par with En Piste in 2015 at the Montreal Completement Cirque Festival. She is the editor of American Circus Educators magazine, as well as a staff writer for the web publication Third Coast Review, where she writes about arts and culture. You can follow her frequent musings on circus via Twitter, Instagram or at Kimzyn Chronicles . Unauthorized use and/or duplication of this material without express and written permission from this site’s author and/or owner is strictly prohibited. Excerpts and links may be used, provided that full and clear credit is given to Circus Promoters and Kim Campbell with appropriate and specific direction to the original content.